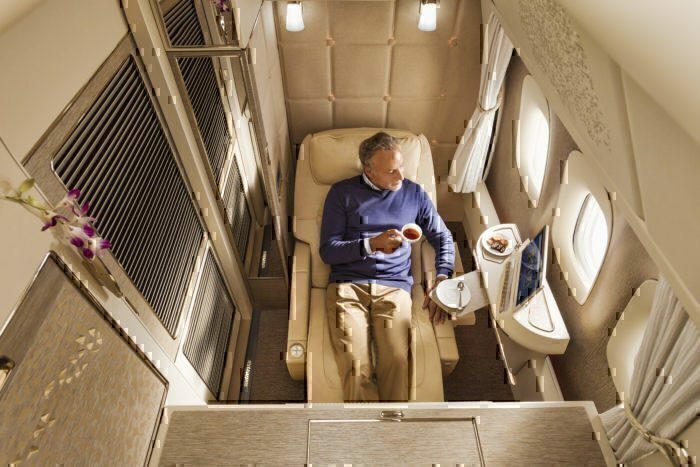 Emirates is launching its new first class suites product on their Dubai to Vienna route. Starting in December, the B777-300ER used for the route will offer suites in first class. The airline will operate the flight daily, with an additional daily flight operated by an A380. The suites, which are inspired by Mercedes Benz, will offer passengers plenty of space during the 6-hour flight. 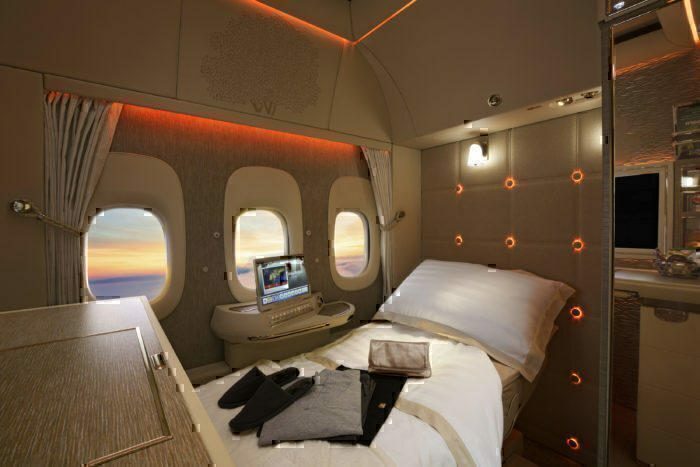 Emirates has hailed its new B777 suite as a “game changer”. The new seating will be laid out in a 1-1-1 configuration toward the front of the aircraft. As such, each passenger should receive around 40 square feet of space to fully relax. The suites have a single chair which can turn into a lie-flat bed at the touch of a button. The new suite product was initially announced a year ago, however, we now know that we will start to see the new suites in just under a month, from December 1st 2019. Each of the new suites will have a floor to ceiling door. Emirates is keen to sell the new zero-gravity seat which has been incorporated in the design. The seat was designed with NASA technology in mind, and as such gives passengers a “feeling of relaxation and weightlessness”. The suite is plenty spacious, featuring enough space to get changed with the bed laid out. When passengers would like service they can video call the crew. Canapes and drinks can then be discreetly delivered through a service window incorporated into the suite. While passengers may be concerned about missing the view from a middle seat, they needn’t worry. These are fitted with virtual windows. The view from outside is taken from external cameras and then projected onto the virtual windows. Additionally, passengers lucky enough to have a real window, then your suite will come equipped with binoculars. Emirates has chosen to offer these for “customers who want to explore the sky outside their windows”. First class isn’t the only cabin which has seen investment. The business class and economy class cabins have also seen improvements. 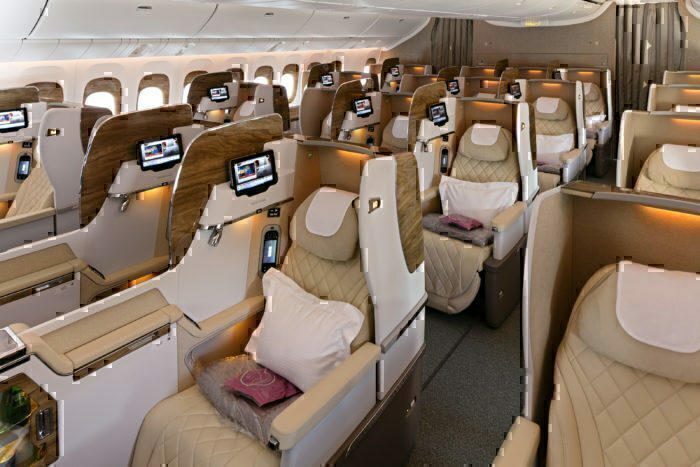 The business class cabin is fitted out with a brand new leather seat with a 72-inch pitch. While the seat transforms into a lie-flat bed, it also comes equipped with a personal minibar. Meanwhile, the economy class offering features a new colour pallet, in addition to ergonomically designed seating. We can’t wait to see what passengers make of the new seats when they go into service in December! Would you like to experience the new first class offering? Let us know your thoughts in the comments down below!